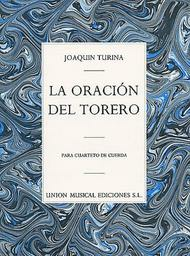 Composed by Joaquin Turina (1882-1949). Music Sales America. Classical. Book Only. Union Musical Ediciones #MUSUME56341. Published by Union Musical Ediciones (HL.14034263). In the pantheon of 20th century Spanish composers: I. Albeniz, M. De Falla, E. Granados, and the Catalan, F. Mompou, Joaquin Turina was the only one to devote a considerable part of his compositional talents to chamber music. Like each of the aforementioned composers, he lived, and studied music in Paris, where he was encouraged by the likes of D'Indy, Ravel, and Debussy. In this brief tone poem for string quartet, La Oracion del Torero 'The Bullfighter's Prayer', the influence of Debussy can be heard, especially in the use of lush descending parallel ninth chords. The influence of music of the Andalusian Gypsies is also quiteevident. This piece became one of the composer's most popular works, often performed in an arrangement for string orchestra. La Oracion del torrero para cuarteto de cuerda. In the pantheon of 20th century Spanish composers: I. Albeniz, M. De Falla, E. Granados, and the Catalan, F. Mompou, Joaquin Turina was the only one to devote a considerable part of his compositional talents to chamber music. Like each of the aforementioned composers, he lived, and studied music in Paris, where he was encouraged by the likes of D'Indy, Ravel, and Debussy. 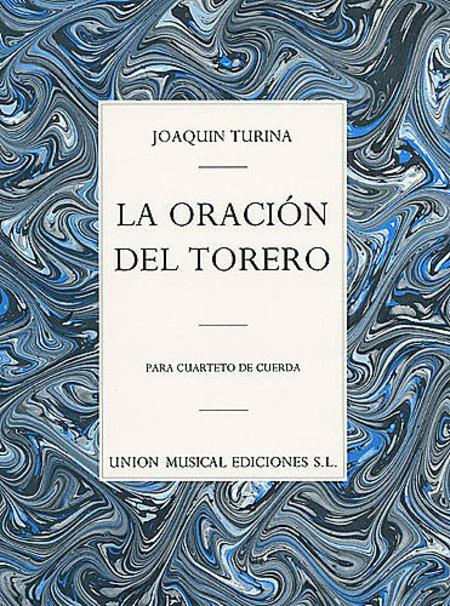 In this brief tone poem for string quartet, La Oracion del Torero 'The Bullfighter's Prayer', the influence of Debussy can be heard, especially in the use of lush descending parallel ninth chords. The influence of music of the Andalusian Gypsies is also quiteevident. This piece became one of the composer's most popular works, often performed in an arrangement for string orchestra.